Joe Earle, Vice-President of Japan Society and Director of Japan Society Gallery, announced his retirement yesterday, effective September 28, 2012. 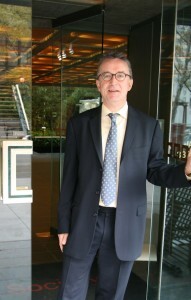 Earle has overseen Japan Society’s visual arts programming since September 2007. Earle recognizes that Japanese art encompasses several genres, and recent exhibits at Japan Society have reflected that. Over the last four years, Earle has been responsible for Japan Society Gallery’s program of 11 temporary exhibitions ranging from Zen ink painting to contemporary bamboo sculpture. KRAZY! The Delirious World of Anime + Manga + Video Games from the spring of 2009 was the second most popular exhibition in the Gallery’s history, and Graphic Heroes, Magic Monsters: Japanese Prints by Utagawa Kuniyoshi from the Arthur R. Miller Collection from the spring of last year drew more visitors than any previous exhibition of pre-modern Japanese art held at Japan Society. Other exhibits during Earle’s tenure have shined the spotlight on contemporary Japanese art, introduced visitors to the intricacies of Japanese textile design, and celebrated Japan’s fascination with the Golden Age of American car manufacturers. Before joining Japan Society, Earl served as Chair of the Department of Art of Asia, Oceania, and Africa at the Museum of Fine Arts, Boston, after spending 15 years at London’s Victoria and Albert Museum. Earle has edited, written or contributed to many substantial publications on Japanese art as well as the catalogues to several Japan Society Gallery exhibits. Earle, who has not yet finalized his retirement plans, is responsible for the Society’s current major exhibition, Fiber Futures: Japan’s Textile Pioneers, which runs through December 18, 2011; the mini-exhibition Postcards from Japan, on display until November 27, 2011; and spring 2012’s Deco Japan: Shaping Modern Culture, 1920–1945, slated to open March 16 of next year. “The final show of his Directorship, Silver Wind: The Arts of Sakai Hōitsu, 1761–1828 (from September 28, 2012 through January 6, 2013) will be a fitting conclusion to a distinguished phase in the Gallery’s forty-year history,” says Sakurai. A search for Earle’s successor will begin in the coming weeks. Previous Previous post: Nissan is Building New York's "Taxi of Tomorrow"